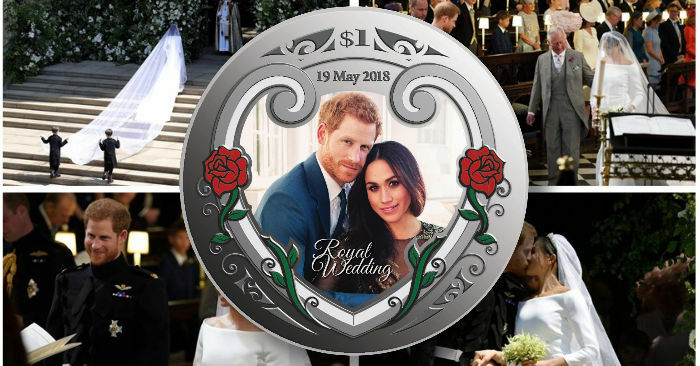 The Reserve Bank of New Zealand has launched (20th May) new and colourful coins which are in celebration of the wedding of HRH Prince Henry of Wales (commonly known as Prince Harry) and his fiancé Ms. Meghan Markle, which took place on the 19th May. The charming couple, who met on a blind date in June 2016, would become what has been described as a very modern romance. The wedding took place at St. George’s chapel in the town of Windsor, which is where the royal family resides when not in London. The chapel was filled with the immediate members of the royal family. The bride, Ms. Markle, is a former American actress who starred in the U.S. television series Suits and looked simply resplendent as she was to be met by her new husband-to-be at the altar of the centuries-old and awe-inspiring chapel. The wedding was officiated by the Archbishop of Canterbury, Dr. Justin Welby, and was presided over by HM Queen Elizabeth II and HRH The Duke of Edinburgh. HRH The Prince of Wales, father of the groom, and his wife, HRH The Duchess of Cornwall, also looked on. The bride, in her exquisite Givenchy-designed wedding dress, arrived at the front gates of the chapel in a sparkling sedan and was escorted to the church by her mother. Due to the absence of the bride’s father from the ceremony from illness, responsibility was then handed to HRH Prince Charles, Meghan’s future father-in-law, who touchingly walked her down the aisle of the sumptuous St. George’s Chapel in the presence of all the invited guests and, of course, to the waiting groom, Prince Harry. The soon-to-be member of the royal family wore Queen Mary’s diamond bandeau tiara, which was an item of jewellery made in 1932 with a centre brooch dating back to 1893. Originally made for Queen Mary, who was married to HM King George V (and Prince Harry’s great-great-grandmother), the tiara was created especially as a focal piece for the centre brooch which was given to her when Queen Mary was the Princess of Teck. Until recently, the tiara had not been seen in public or worn by any member of the royal family since Queen Mary last wore it, and was loaned to her new granddaughter-in-law by the Queen herself. Just before the ceremony, it was announced by Buckingham Palace that Her Majesty had elevated her grandson to the rank of a Royal Duke, giving him the title HRH the Duke of Sussex. As such, the newly married couple will now be known as Their Royal Highness’ the Duke and Duchess of Sussex. As the couple exchanged their vows, then rings, and the pronouncement by the Archbishop of Canterbury that they were now husband and wife, they kissed at the altar and the Duke and Duchess then headed the procession out of the chapel. After the ceremony, the newly married couple took a carriage ride through the streets of Windsor to greet the thousands of well-wishers and awaiting media. Their Royal Highness’ then went on to the reception which was held at Frogmore house, a 33-acre estate on the grounds of Windsor Castle, and a favourite retreat for many members of the royal family. 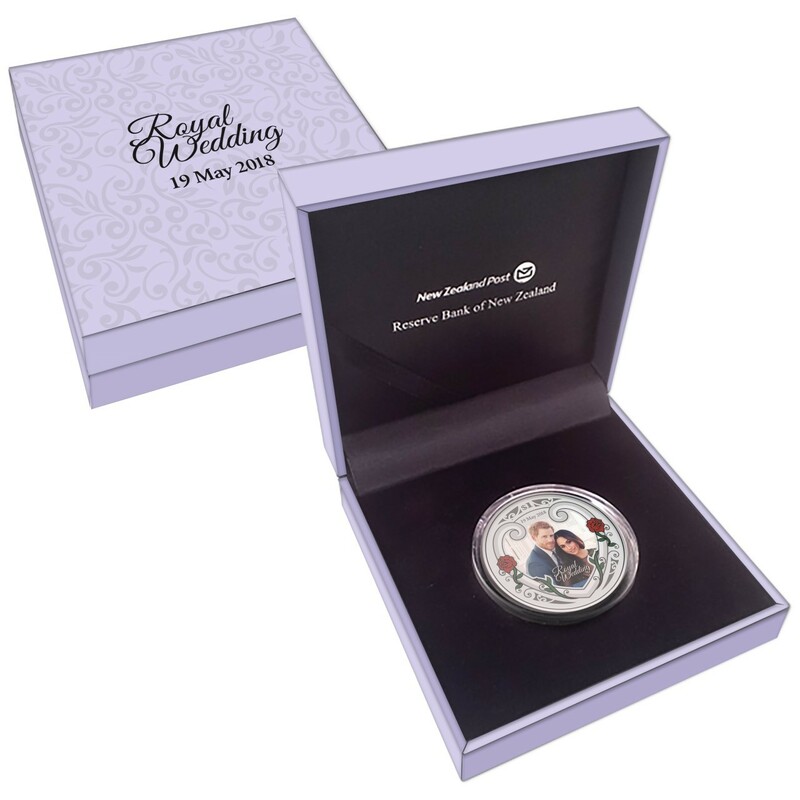 The coin is produced by the Mint of Norway at their facilities in Kongsberg, on behalf of the Reserve Bank of New Zealand, and is designed by Dave Burke of Auckland. 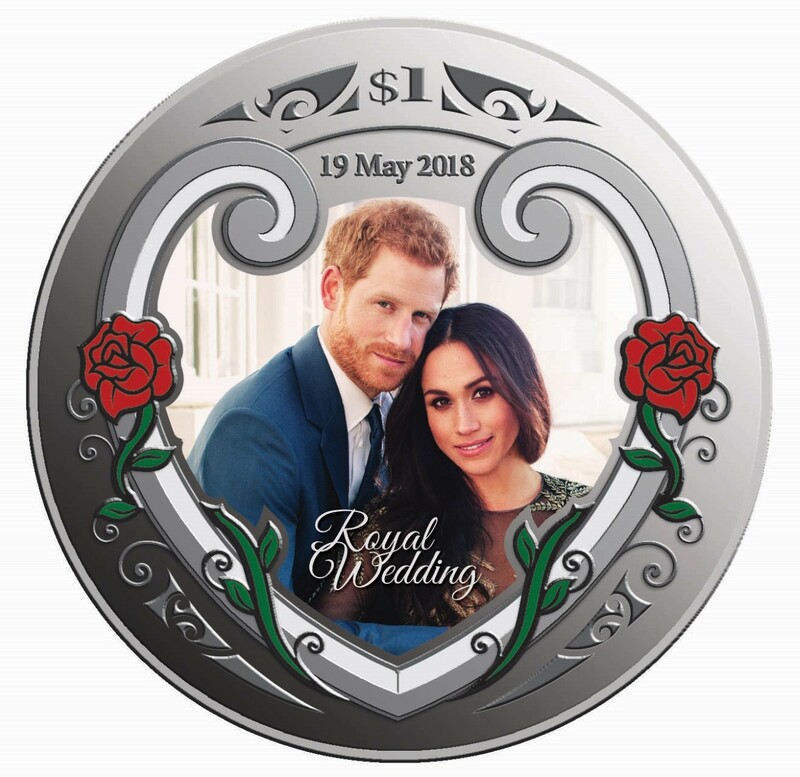 The reverse includes a colour design and is based on the official photograph of the royal couple taken on the announcement of their engagement in November 2017. 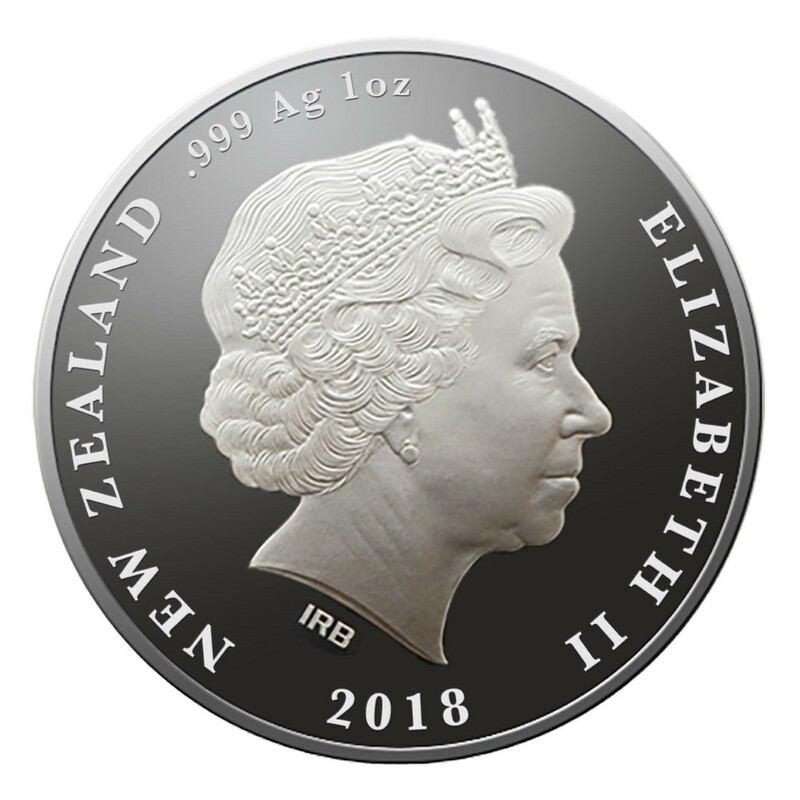 The obverse includes an effigy of HM Queen Elizabeth II, as designed by sculptor Ian Rank-Broadley, and has been seen on all of New Zealand’s circulation and many commemorative coins since 1999. The year of issue is placed below the Queen’s portrait. The coin was launched on the 21st May and will be available through pre-issue ordering from the New Zealand Post, which is the official distributor of the coin. Interested collectors can inquire at the website of the New Zealand Post. Shipments will commence shortly after the official issue date, which is expected to be in June.